I haven’t been reading very much recently. The current uni workload I have is zapping a lot of my time and energy – even when I’m not sat at my desk studying I’m thinking about it. This doesn’t make for particularly good reading conditions (or blogging conditions as you may have noticed from the lack of recent posts). 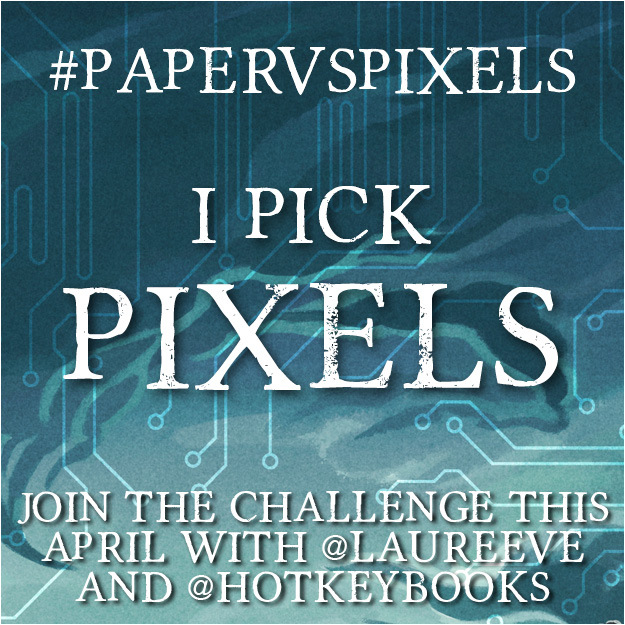 When I saw Hot Key Books launch Laure Eve’s #PaperVsPixels challenge for April I thought I’d get involved in the hope of getting back into the reading flow a little more. The challenge: read in only one format for the whole month of April. If you’re a digital type, read physical. If you’ve never tried audio – try nothing but audio. For one month. Record your experiences on #papervspixels and share them with us on tumblr, twitter, YouTube or your blog – and let me know how you’re doing @LaureEve too! I love both physical and eBooks, I think both have very valid places in my reading life. I looked at my 2014 reads spreadsheet (yes, I have a spreadsheet and it is a thing of beauty) and worked out that I’d read far more physical books than eBooks, if it hadn’t been for a pair of long train journeys I’d have read even fewer. So for April I’m picking Pixels. I have a good couple of hundred books waiting for me to read them, over half are eBooks. I’m really looking forward to spending some quality time with some of the books I’ve downloaded and proceeded to ignore. I have no idea how many books I’ll manage to read, the last three months have seen me only read 3 – 5 books, hopefully I’ll manage to increase this count a little. Previous Post Banished is in the wild. Next Post The Lion King flies.